The heat was intense. Sweat trickled down the warrior’s face and stung his eyes, but he didn’t feel it. The sword in his hand was heavy. He slipped from shadow to shadow, never seen, never suspected, his footsteps practised and silent. He stopped to lean against a boulder, breathing hard. Far below him, molten lava hissed and crackled. He waited. A large shape slithered past him, only metres away. He gripped his sword tighter. The warrior followed, melting behind a statue of some terrifying and unnatural creature. The shape moved again, away from him this time. Maybe he was suspected. The warrior tried to still his thumping heart, concentrate. If he were caught, would it attack him with fire? Or with the powerful jaws that could crush pure Mythril? Or worse, would it do that other thing, the thing so awful it had destroyed villages, cities; even his own family? The warrior took long, deep breaths, felt his strength grow. The thing was a thief, a coward and murderer. But it would end now. Careful to stay hidden in the shadows, he inched his head around the statue. There it was! And … what was this? Its massive body hunched over, the blood red scales rising and falling rapidly. It was wounded. The warrior didn’t hesitate. The chance was too good. He leapt out from behind the statue, feeling a terrible roar rise from the pit of his gut and explode through his lips as he rushed at the dragon. It would be a clean kill. “No!” he cried, lunging at the dragon as it reared onto its hind legs and took a great, shuddering breath. The warrior froze. It was too late. The scene around him began to fade – the rocks and boulders, the grotesque statues, the volcanic walls all began to grow weaker, like he was falling into a cloud. He watched in horrified fascination as blue mist began to pour from his mouth and flow towards the dragon. His soul. He tried to fight it, to step back and break the connection, but he was paralysed. The dragon was winning. The warrior felt his strength drain. On the edge of his consciousness he felt something warm splashing onto his hands. He looked down, and through the haze saw blood soaking his arms and tunic. By the Elder’s luck, he had struck the dragon after all! He forced his head up to watch the dragon’s jaw dropping, its pupils contracting. The blue line of the warrior’s soul grew fainter, and then snapped. He was free! In a blur, he wrenched the sword from the dragon’s soft belly and threw it aside. There was no more use for it now. As quickly as he could, he turned and fled from the cavern, hearing the dragon howl behind him. “Don’t you know what you’ve done?” it screeched, thrashing its tail wildly and crushing the statues around it to dust. It seemed to be crying … no … it was laughing. “You’ve cursed your entire world!” There was a deafening crash, and then, silence. The warrior bolted through the volcano, stumbled and fell, picked himself up, and ran on. The lava was hot, so hot, and yet his blood ran cold. Cursed your entire world … Cursed? But he’d killed the dragon! Ended the terror! He pelted over the flowing rivers of liquid rock, through the narrow passageways and across the great wide rooms of what had once been a great Temple. He didn’t notice the lava cooling, didn’t see the thin blue mist that crept up the walls and over the ground. 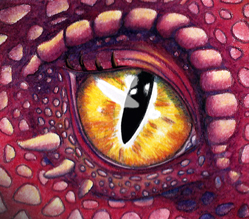 It swirled around his feet, drifting deeper into the volcano – back towards the dragon. Finally, the warrior burst through the volcano’s entrance and into bright sunlight, but he didn’t stop. His feet pounded over grassy fields. The sun burned almost as hot as the volcano; he could taste the salt of his own sweat. And yet, despite the raging sun, and the hot rush from running, still his blood ran cold. He felt wrong – the whole world felt wrong. Had he taken a few steps to his left, he would have stepped right into a patch of dust that was slowly growing at the base of the volcano, and then he would have been sure. But he didn’t. He didn’t see the blue mist that curled up from the ground and drifted towards the volcano, nor did he see the grass dying and the buttercups shrivelling into nothing. The dragon’s blood all over his clothes should have been attracting flies, yet he didn’t notice there wasn’t a single one in sight. He just kept running. Slowly the blue mist from the field began to flow down the cavern walls, inching closer to where the dragon had fallen. A thin tendril of the mist circled the heart a few times before it was suddenly sucked into its flesh, like a leaf caught in a whirlpool. Instantly the heart began to change. Black tar-like globs began to seep from it, crawling over its surface, hardening to stone. More mist crept down the cavern walls, and soon there was a steady stream of it pouring right into its blackened surface. The souls of grass, and flies, and buttercups. David sighed and sank back into his seat. At least Mum was trying. He watched her try to smooth her curly red hair, shooting nervous looks at Dad as he read the paper. Eventually the driver turned off the highway and onto a long, dusty road lined with gum trees. It was so unfair. Only one month of the Christmas holidays left, and he had to spend it in the middle of nowhere. “If it’s going to be so much fun, why don’t you stay with her?” mumbled David. Dad flicked the paper and grunted. Like Mum, he didn’t look much like David either, with black hair and broad shoulders; but unlike Mum, who smiled and laughed at almost everything, Dad had a face that could never seem to get the hang of a happy look. David’s gaze returned to the scene flying past. Blackwater was a miserable place. Rusty car yards on every corner, cracked roads, old, tired houses. Even the trees looked worn out. They passed through the town – all fifty metres of it – and drove along a thin road that snaked between the blocks of ginormous South East Queensland properties. As the driver pulled up alongside a dusty driveway a wave of panic gripped David’s chest. “You don’t have to do this, Mum,” he said, careful not to sound too hopeful. “It’s only for a little while.” Then she turned and looked out the window, and David knew he’d lost. The car stopped, and a minute later David was standing on the driveway with his parents while the driver took his suitcase and pillow out of the boot. “You’re not even going to drop me at the house?” David said. Dad nodded to him and climbed back into the car, Mum following close behind. A few seconds later the car turned a corner, and was gone. David picked up his suitcase and pillow and sighed. He stood there for a long time, taking in the desolate landscape of yellow grass and dull grey gum trees. No shopping centre. No movie complex. Not even a library. Suddenly a strong, bony hand grasped his shoulder. His heart leapt into his throat as he turned and stared up at the blue haired woman peering down at him. Grandma. He swallowed hard. Unlike most old ladies, who are short and plump, Ethel Flynn was tall and thin, her back straight as a ruler. She loved to wear makeup – her cheeks were so thick with blusher, David wondered if she put it on with a spatula. When she smiled, (which wasn’t very often,) her straight yellow teeth stood out horribly against her bright red lipstick. Her eyes were as hard as steel, and she was so skinny her collarbones stuck out. But there was no questioning her strength; David’s shoulder felt like it was in a vice. Dead grass ran along the driveway all the way up to the house, which was half hidden behind by two huge gum trees. David had always thought Grandma’s house was a kind of monument to her insanity. It had started out as a two-story Queenslander with a wraparound porch, but it had been half demolished, rebuilt and added to so many times that now it looked like a lopsided patchwork quilt. Extra rooms, verandas and box windows stuck out everywhere. As David stepped through the front door and into the living room, a musty smell met his nose. The room was cluttered with broken chairs and mismatched sofas, and the floor looked like it hadn’t seen a vacuum in its entire life. Instead of the little silver teaspoons other Grandmas collected, there was an assortment of brightly coloured plastic potato peelers arranged nicely in a china cabinet. There was even a framed picture of a potato peeler on top of the TV. It looked like it had been cut out of a magazine. And wherever there wasn’t a peeler, there was a doily. There were doilies on the armchairs. There were doilies on the coffee table (the legs of which were carved to look like potato peelers.) There were even doilies hanging behind all the pictures on the walls. Grandma’s bulldog, McFluff, was rolling all over a particularly elaborate one on the floor – the nasty grey tinge it had gave David the impression it was the dog’s favourite resting spot. A dull light filtered through the lacy curtains that hung from every window, making it feel as though it was always four o’clock in the afternoon. David wondered how a house could be so crazy, and yet so boring at the same time. Grandma led David upstairs to his room. He dragged his suitcase behind him, his nose itching from the dust she disturbed. He almost had to jog to keep up with her as she strode down the hall. “Er – that’s nice,” said David, trying to peer past Grandma. David shuffled his feet nervously while Grandma continued to stare at him. He wondered if he was supposed to say something. “I’m twelve,” said David, his cheeks flushing. “And I’m not delicate. I’m just … growing slowly.” That’s what Mum always said, anyway. “All right, settle down, I was just askin’,” Grandma said, then turned and walked back downstairs, muttering things about sawdust and clouds and gene pools. With a bit of wriggling David managed to slip through the bedroom door. He dropped his suitcase and looked around. At last, something had gone right. The room was enormous. A huge window faced the back yard, flooding the room with afternoon light. Beneath the window was a big, old-fashioned bed, much bigger than his bed at home. On the opposite side of the room sat a large, antique looking desk that David thought would be perfect for him to write his stories on. And not a single doily in sight. The deep blue curtains by the window did have little horses printed on them, a bit girly, but otherwise it wasn’t too bad. David tossed his pillow onto the bed and gazed out the window at Grandma’s property. It was one of the largest estates in Blackwater, and although it had been in his father’s family for generations, it had never been used for farming. Nothing but thick bush stretched all the way to the horizon. The little bubble of happiness that had started growing in his stomach burst. “Some place for an adventure,” he sighed. As promised, his parents called him on the second night. Grandma’s phone was about a hundred years old, and it made weird crackling noises when David held it to his ear. Mum’s voice sounded like it was coming from the other side of the world. “…and then we nearly lost our baggage in Cairns, but it turned up in the end, thank goodness,” she was saying. David stood in the hall, throwing glances at Grandma as she pottered around in the kitchen, singing to herself. He wished she would go away so he could beg his mother to come back and get him. “Are you eating enough? How’s Grandma?” asked Mum, as though she could read his thoughts. “You’ll have to ask your father,” said Mum. “Honestly, David, we only got here yesterday,” Dad sighed. There was a crackle, a click, and then nothing. David placed the phone back on its hook, aware that Grandma had stopped singing. He avoided her eyes and headed for his room, where he shut the door and sat on his bed until dinner. The first interesting thing happened on the third day. Grandma didn’t believe in air-conditioning – she said it was ‘un-Australian’ – so that by 10 o’clock, the house was like a furnace and it was too hot to do anything. Grandma was out in the back yard, doing Grandma things. She’d hardly said a word to David since he’d arrived – not that he’d given her much of a chance. Within his first few days at Blackwater, he had devised a plan that meant he hardly had to leave his room. In the morning, he’d go downstairs and grab a bit of breakfast, then sneak it up to his room and spend the entire day writing stories or drawing treasure maps at the antique desk. For a while, the plan worked splendidly. Grandma never bothered him, and he really only saw her at dinnertime when she would make him come down to eat with her and McFluff. Grandma liked to watch TV while they ate, so David wasn’t allowed to talk. He didn’t mind. What would they talk about, anyway? Potato peelers? That day David was sitting at the antique desk, where a half written story lay forgotten next to his cold toast. He was hot and bored, and thinking about his parents. He wondered what they might be doing right now – probably lying on some tropical beach, sipping drinks that had little umbrellas in them. He shrugged to himself. Or maybe they weren’t. That place probably didn’t have any of that kind of stuff, he thought, fiddling with a strange, circular knot in the wood of the desk. It was so unfair … how could it possibly take a whole month? His anger flaring, he pressed hard on the knot. There was a click and then, “Ow!”, something hit him hard in the stomach. He looked down – it was a secret drawer. He peered closer. Lying inside was a large, heavy book, covered in a thick layer of dust. David pulled it out, careful not to damage it. ‘Lampwick’s Complete Bestiary’ was printed in golden lettering on the front. The book was so old the lettering was peeling off, and it didn’t shut properly. David carefully opened the cover, afraid it would fall to pieces in his hands. Someone had scrawled ‘Elsie’ in big, childish letters inside the dust jacket. David thumbed through the pages; it was some kind of animal encyclopaedia. At first nothing seemed out of the ordinary – there were aardvarks, bears and cockatoos, with illustrations of bone structure and jaw development, and long articles about migration patterns and mating habits. But when he got to ‘D’, he stopped. David had to read the title three times before he was sure his eyes weren’t playing tricks on him – ‘Dragons’. Quickly, David read the entry, and was surprised to find that it was just as no-nonsense as the rest of the book – as if the person who had written it had actually believed dragons were real. David flicked through the chapters. There were entries on griffons, sea serpents, goblins, even salamanders, all mixed in with horses and buffalo and whales. As he turned to another page something small and red tumbled out of the book and into his hand. He held it up to the light. “Cool…” It was a tiny model of a ferocious-looking dragon with red scales and gold-tinted horns. David wondered if there were more of Great Aunt Elsie’s secrets hidden around the room. Maybe even around the entire house! He slipped the dragon into his pocket and went back to reading the Bestiary, only putting it down when Grandma called him down for dinner hours later. The second interesting thing happened the next day. Having finally admitted to himself that the bedroom was too hot, he had gone down to the kitchen table to read the Bestiary. A nice breeze was coming through the back doors, and soon he was so lost in Lampwick’s chapters on lions and polar bears and great colourful birds that he didn’t even notice Grandma standing in the doorway. “You’re coming outside today,” she said. “Whatchoo reading?” Grandma asked him, frowning at the book on the table. Grandma grunted. “Someone’s been writin’ in it,” she said, pointing at the page David was reading. David looked closer. She was right – someone had circled a few of the pictures in red ink. He looked at Grandma. “It wasn’t me, I swear,” he said. “What for?” asked David suspiciously. “It’s bath day,” said Grandma. “You’ll see,” she said, and disappeared outside. David glanced at the book, wondering if he should ignore her. What could she possibly do to him? Then he shivered. She was crazy, remember? She could do anything. Reluctantly he closed the book and dragged himself into the backyard. But instead of Grandma, there was only McFluff, lying on the porch with his chin resting in a pool of dog slobber. He shook himself as David walked past, spraying him with gobs of drool. David could have sworn he did it on purpose. In the middle of the back lawn, an old wooden tub was slowly filling with water from a garden hose. Grandma was nowhere in sight. David heard the squeak of a tap being turned off and saw Grandma coming around from the side of the house. She had a manic look in her eye. He opened his eyes. Grandma was pulling a reluctant-looking McFluff towards the tub by his collar. “Quick, get his squeaky!” she cried, frantically waving at a yellow blob next to the scrubbing brush. David raced across the back yard and scooped it up. It was an ancient rubber duck, so old one of its eyes had been chewed right off. It looked positively evil. As soon as David tossed it into the tub McFluff stopped resisting and leapt head first into the freezing cold water. He came to the surface with the yellow duck clamped in his jaws, chewing its remaining eye with grave determination. McFluff dropped the duck to snap at the bubbles floating around his head. “Barking mad, you might say,” said Grandma, screeching with laughter. David shrugged and looked down at his shoes. They were stained with dog drool. “After lunch, maybe you should go say g’day,” she pressed. “You don’t like other kids?” said Grandma, a little too casually. “Well, there’s not much around here for a kid to do by himself,” Grandma said. “F-funnel webs?” David hated spiders. He looked back into the shadows under the gum trees. Maybe he had just imagined there was something great about it. David nodded and tried to catch her eye again, but she was too interested in an invisible spot of dirt on McFluff’s head. At least it looked like she didn’t need his help any more. He threw one last glance at the path hidden amongst the gum trees, then turned and walked back up to the house, his mind bursting with questions. He flinched as a bird flew up from the shadows and came to rest on the trestle near the window. It was a rainbow lorikeet, and it was looking at him with the most incredibly intelligent eyes. It studied him for a while, sizing him up with a businesslike stare. David wondered if he was going mad. Then the bird leapt into the air and disappeared back into the shadowed forest so fast, it was as if it had never been there at all. Blinking hard, David stared out at the bush. There were no rustling leaves, no twitching branches. Everything was perfectly still. His heart fluttered with excitement. What was in there? That bird, it had seemed so … aware. Like it knew who it was, and what it was doing, and even as if … as if it had a secret. Tomorrow, he thought. Tomorrow he would go down to the back yard, find the gap between the weeds, and see what was hidden at the end of the path someone had obviously tried so hard to hide. Enjoying this story? Grab it now in print, or on Kindle for just 99c.